Yesterday was International Women’s Day and it’s the two year anniversary since a law was introduced designed to protect men and women from domestic violence and abuse. The Domestic Violence Disclosure Scheme (DVDS) is more commonly known as Clare’s Law – named after Clare Wood who was murdered by her ex-boyfriend in February 2009. Clare didn’t know about his history of violence against women. The scheme allows the police to disclose information about an individual’s previous history of domestic violence or violent acts if requested by their partner or relative. So if you’re worried about your own relationship, or someone else’s, you can request information and find out whether there is a known history of abuse. 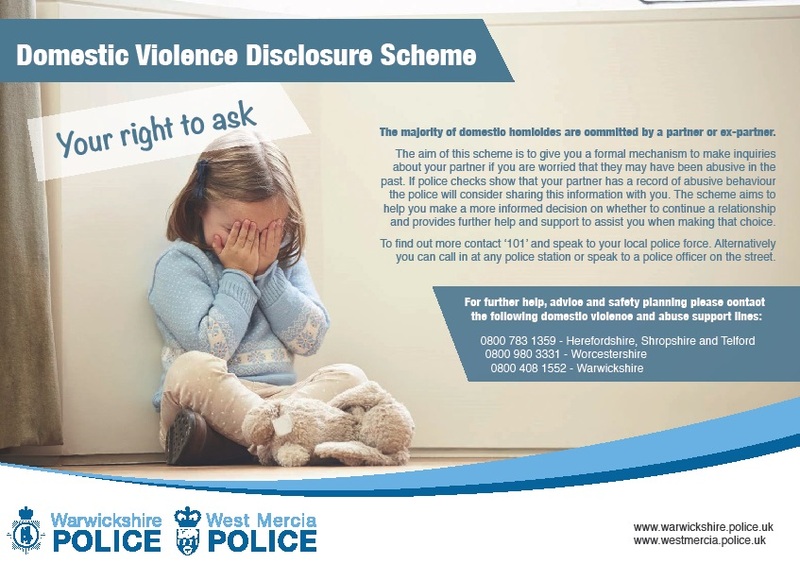 In the last two years 48 women and 5 men in Warwickshire have used their ‘Right to Ask’ the police whether a new or existing partner (either their own or a friend or relative’s) may have a violent past and 47 disclosures have been made. If you are in a relationship and worried that you partner may have been abusive in the past please click here. If you would like to talk to someone about domestic violence and abuse please call the Warwickshire Against Domestic Abuse Helpline: 0800 408 1552. In an emergency, please call 999.